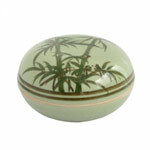 To craft this box, the artisans firstly cast a clay mix inside a mould. Once solid enough, the piece is removed from the mould and detailed by hand. 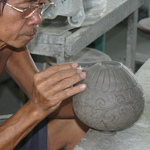 When fully dried, it is then fired in the kiln at a temperature of about 800 degrees Celsius. Next, the piece is hand-painted and dipped in a glaze mix before to be left to dry. Once fully dried, it is fired again in the kiln at a temperature of about 1,300 degrees Celsius. 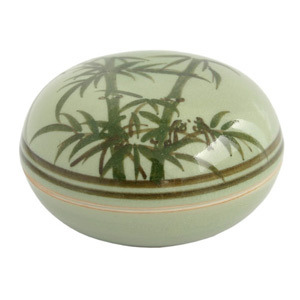 The surface of this celadon box is glossy, green and highly crackled.